How monogenic is monogenic? Dravet Syndrome is a severe epileptic encephalopathy starting in the first year of life. More than 80% of patients have mutations or deletions in SCN1A, which makes Dravet Syndrome a relatively homogeneous genetic epilepsy. In addition to SCN1A, other genetic risk factors for Dravet Syndrome have been suggested, and current, large-scale studies including EuroEPINOMICS-RES are studying the genetic basis of the minority of Dravet patients negative for SCN1A. A recent paper in Epilepsia now suggests that a significant fraction of patients with Dravet Syndrome also carry rare variants in SCN9A in addition to the mutations in SCN1A. Is a mutation in SCN1A not sufficient to result in Dravet Syndrome, but needs additional genetic modifiers? SCN9A. Historically, SCN9A encoding Nav 1.7 has usually not been assumed to be present in the Central Nervous System, but is thought to be a gene exclusively expressed in the peripheral nervous system, particularly in nociceptive neurons that are important in the perception of pain. Accordingly, mutations in SCN9A result is diseases like primary erythermalgia, a disease where bouts of pain in arms of legs are accompanied by a swelling and reddening of the extremity. Mutations in SCN9A also cause paroxysmal extreme pain disorder. Recessive mutations in SCN9A can results in the complete loss of pain sensation. SCN9A was first suggested as a gene predisposing to Febrile Seizures (FS) or epilepsy by Singh and collaborators, who identified a large family with autosomal dominant FS and a mutation in SCN9A. Functional studies of this mutation in mice suggested that this mutation may lower the seizure threshold. They also investigated patients with Dravet Syndrome and suggested that up to 10% of patients with Dravet Syndrome may have rare variants in SCN9A in addition to SCN1A. Now, Mulley and collaborators confirm these findings and compare the mutation load to controls. Mutation load. Mulley and collaborators investigate the frequency of rare SCN9A variants in patients with Dravet Syndrome, most of whom were positive for mutations in SCN1A. While rare variants in SCN9A are rare in controls (2%), as judged by the data provided by the Exome Variant Server. However, rare, inherited SCN9A variants are found in roughly 10% of patients with Dravet Syndrome, a five-fold enrichment. The study by Mulley and collaborators investigated 125 patients and the study by Singh and collaborators screened 109 patients with Dravet Syndrome, suggesting that the observed enrichment is significant and not due to a chance finding in a small group of patients. What could be the explanation for this finding? Before diving into possible speculation, let’s quickly revisit the chromosomal anatomy of the sodium channel gene cluster on human chromosome 2q24. Frequency of rare variants in SCN9A in patients with SCN1A-positive and SCN1A-negative Dravet Syndrome. There is a five-fold enrichment of rare SCN9A variants in patients with Dravet Syndrome. Most of these variants are inherited, while the SCN1A mutation is usually de novo. This suggests that mutation in SCN1A may only result in Dravet Syndrome if occurring on a particular genetic background. This, hypothesis, however, would suggest that de novo mutations in SCN1A would also be seen frequently in other phenotypes. Gene cluster. Probably to due the evolutionary mechanism of gene duplication, sodium channels on chromosome 2 have duplicated and produced a cluster of genes in close vincinity, including SCN1A, SCN2A, SCN3A, SCN7A, and SCN9A. Therefore, particular variants in SCN9A are very likely to be linked to either exonic or intronic variants in any of the other sodium channel genes including possible regulatory elements. This means that a rare variant in any of the sodium channel genes may simply be a marker for a particular genotype. This provided a difficulty in the initial study by Singh and collaborators, since the linkage interval of their FS family included the entire sodium channel gene cluster. Despite the evidence of functional studies, it might be possible that their SCN9A variant was simply a marker for an intronic variant or regulatory variant that impacts on SCN1A expression. This might still be considered a possibility given the overwhelming evidence for the role of SCN1A in fever-associated epilepsies. 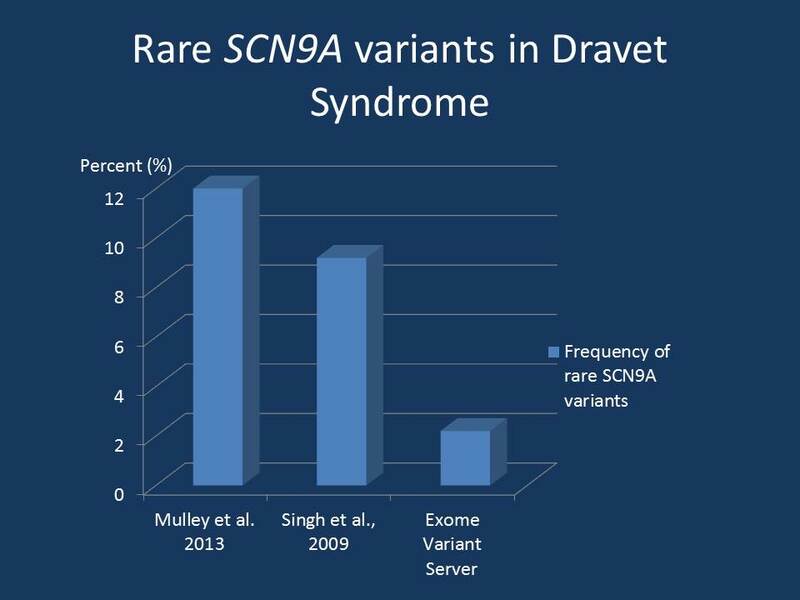 Likewise, the inherited rare variants found at an excess in patients with Dravet Syndrome do not necessarily argue for a role of SCN9A. They might simply point towards a particular genotype at the sodium channel gene cluster that impacts on gene expression of one or more sodium channel genes. However, some of the SCN9A variants identified by Mulley and collaborators are predicted to have a functional effect, indicating that the function of Nav 1.7 may be altered. Given functional data in animals, this might lead to lowered seizure threshold in humans. How is this possible? Given the study by Mulley and collaborators, there is strong evidence for an enrichment of rare SCN9A variants in patients with SCN1A-positive and SCN1A-negative Dravet Syndrome. One reason that it took me a while to write this post was my lack of imagination with the respect to the genetic model involved (the other reason was being on nightshift). If SCN1A de novo mutations result in Dravet Syndrome but require a certain “genetic background”, what happens to those de novo mutations in SCN1A that do NOT occur on this background? There is some evidence that de novo SCN1A mutations may also result in other phenotypes including autism and intellectual disability, but it is not a very prominent gene in these phenotypes. Unless the rare SCN9A variants are only one example of many risk-conferring genotypes, we would expect a significant number of SCN1A de novo mutations in controls and other phenotypes. The particular risk-conferring genotypes would have to add up and be present in the vast majority of individuals to explain the observation that de novo mutation in SCN1A are much more likely to result in Dravet Syndrome than in other phenotypes. Lessons learned. Just when I thought that the role of SCN1A in Dravet Syndrome was firmly established and even emphasized by the identification of missed SCN1A mutation through exome sequencing, the publication by Mulley and collaborators makes me start thinking again. Their study suggests that de novo mutations are not the complete story, but that other genetic factors may significantly contribute. With the large datasets on patient-parent trios available from studies such as EuroEPINOMICS-RES or Epi4K, we might be able to take a first look at how de novo mutations and inherited variants interact. This will hopefully help us better understand how these variants result in epilepsy and might point out novel treatment avenues for patients. This entry was posted in 2013, Epileptic encephalopathy, EuroEPINOMICS, Familial epilepsies, Papers and tagged autism, channelopathy, Dravet Syndrome, epileptic encephalopathy, genetic background, genetic modifier, intellectual disability, ion channel, nightshift, SCN1A, SCN2A, SCN3A, SCN8A, SCN9A. Bookmark the permalink. I would like to see what role the CACNA1A role plays with a de novo mutation of Dravet Syndrome. Has there ever been a study linking these two genes (SCN1A and CACNA1A) together? My son has both alterations while my husband has only CACNA1A alteration. thank you for your comment. We had discussed a possible interaction between SCN1A and CACNA1A in a blog post last year (http://wp.me/p1V5Ds-jl). However, I am not sure how strong this connection actually is, as many rare variants may also be found as “genomic noise” without any real consequences to the function of the ion channels involved. thank you for your comment. Our blog is a research blog for scientists in the field, therefore some parts of our posts unfortunately need to be a bit technical. Please be aware that we do not give medical or genetic advice on our blog. We recommend that everybody who has relevant medical or genetic questions discuss these issues with the treating physician. In this post, I have discussed a recent publication that suggests that in addition to a mutation in SCN1A some patients with Dravet Syndrome may have further genetic changes that might be relevant. The contribution of these “additional” genetic changes that usually come from one of the parents is probably minor. SCN9A is a gene that is related to SCN1A and the recent publication suggests that there are more genetic changes in SCN9A in patients with Dravet Syndrome than you would expect. At this point, this is just an observation and it is not yet clear what this means.